Intel (INTC) had better than expected earning report. It jumped to $18.02 in after-hours trading. The company reported $0.18 adjusted earnings per share while analysts were expecting $0.08. Same time last year was $0.28, i.e. a drop of ~35.7%. Stock price at about the same time last year was between $22-24. 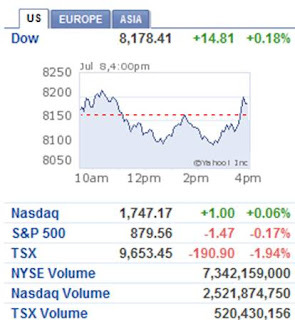 If we discount 35.7%, stock price today would be ~$14.1-15.4. What else? Sales were down 15.3%. The company, though, has "clear expectations for a seasonally stronger second half". Can you interpret it as good news? I personally don't. I always like INTC. I thought it is a nice company and Intel chip is almost present in every computer. I have been looking at it since January 28th, 2009. I had a little note in my agenda. It says $14.01 on that day. Now it looks expensive. Investors will soon realize that, especially when macro economy picture becomes clearer to them. It's just hype right now. Volume in the markets is still very light these days. More earning report is coming out this week. 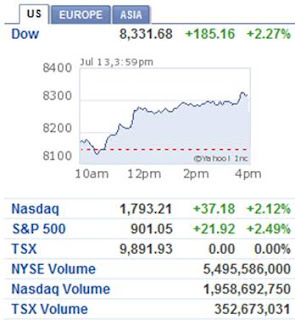 The markets had huge gains today after a series of selling in the past week. Financials were up. Investors acted on the comments by a bearish analyst Meredith Whitney who upgraded Goldman Sachs (GS)to "buy" and also said that Bank of America (BAC)has value. It is believed that financial has to recover first before everything else does. Therefore these positive comments are taken as good news about economy recovery and outlook. GS is reporting its earnings tomorrow. I don't thnk GS is moving any higher tomorrow. Investors has already acted ahead of earnings and priced in any positive news. Railroad operator CSX (CSX) reported its second earning today. The company reported 20% drop in earning and 21% drop in shipping volume. Considering that oil has been down significantly since last year and the company has already done some other cost cutting, the earning was still down. However, the CEO said that there are some signs that they may be seeing the bottom in many markets. It looks like that once again people are optimistic about the economy and the markets. I am not though. 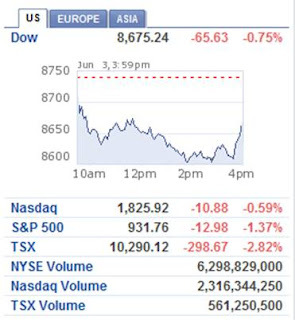 The markets slide today. 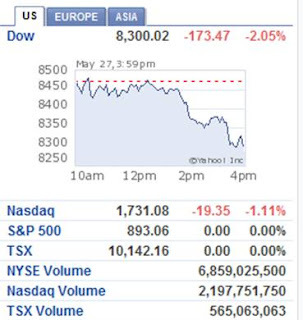 S&P500 dropped -3% and is below 900. It is slightly below the 200 day moving average which is about 900.76. Oil dropped -$2.52, at $67.50 a barrel. The drop in everything is partly due to the World bank said that it expected the global economy to shrink by 2.9%. It's last prediction was 1.7% in March. When the World Bank is seeing worse in economy, one can guess the reaction in the markets - exactly what we saw today - selling from the rally we've had since March. I see today as a reality check. Investors are jumping too far ahead of fundamentals. Less bad news are not good news. Unfortunately to me, Apple (AAPL) is still very high at $137.17. Steve Jobs had liver transplant. It looks like there is a chance that he will come back. 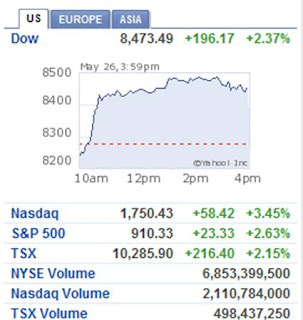 When S&P hits ~850 or Dow hits just below 8000, the market will be 10% from it's year high. It will be time to get in. The markets closed slightly up on Friday. 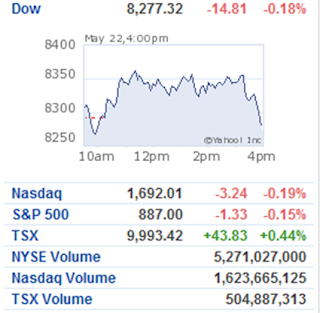 Over the week, S&P500 was down -2.6%, the Dow was down -2.9% and the TSX lost -3.35%. As summer is here, the markets are expected to slow down. The fall has paused after 3 days in a row. S&P gained +0.84% or 7.66 points. Volume was low though. 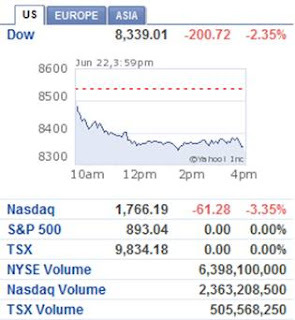 Three days in a row the market has dropped. S&P500 is down -3.75% since last Friday. Volume is not bad. Investors seemed to be rushing to cash out from the earlier rally as they realize that the fundamentals to lead the market higher are lacking. Fedex (FDX) announced it's latest quarter results which are better than expected; however, they issued gloomy outlook. They expect that their first two fiscal quarters in 2010 will be extremely difficult. I see transportation as a second messenger in signaling how the economy is doing. When businesses are good, the need for transportation increases. President Obama released his plan for financial regulation. Analysts say that the regulation could hurt banks' profits and their competitiveness. The proposed regulation demands that, among other things, an increase in capital, which lowers the banks' leverage and potential profits. However, it might take 2-3 years for negotiation before the plan turns into law. How far the changes would be remains an open question. My view is that whether there is regulation or not, banking is the biggest player in the game of economy, just like in the board game - Monopoly. 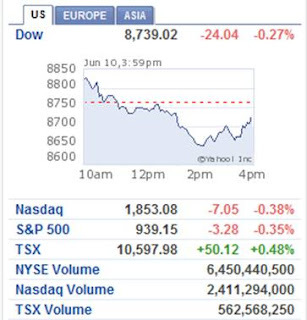 The market dropped second day in a row. S&P500 has dropped -3.6% since yesterday. Crude oil fell -$0.15 to $70.47 a barrel. Building of new homes and apartments rose 17.2% in May, highest in the last 3 months. A large percentage of it comes from multifamily housing. This raises the supply and demand issue - the unbalanced one. There is already a huge back log of existing homes which will take 10.2 months to deplete (we've talked about it in my previous blog here). Adding more new homes to one side of the equation might not be encouraging to the market. It will drag house prices down more. The Federal Reserve said industrial production dropped a larger-than-expected 1.1 percent in May as the recession hurt demand for manufactured goods including cars, machinery and household appliances. Bestbuy (BBY) reported a weak Q1. Earning per share is better than expected but sales fell more than expected. BBY says it is expecting a difficult environment. Its stock fell 7%. BBY is the first major retail to report Q1. I guess we have a taste of how the retail market has been doing. 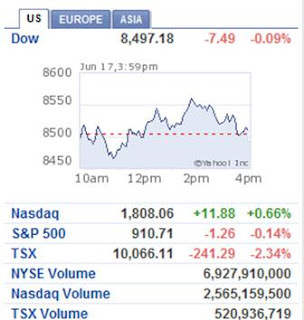 The market opened low and remained lower. It was searching for direction last week. 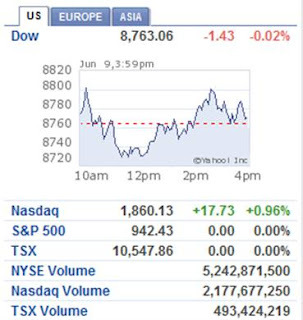 Investors have been cautious about the stocks going higher and the fundamentals of the economy. They chose to take profits today. Today is the biggest one-day drop since April 20th. 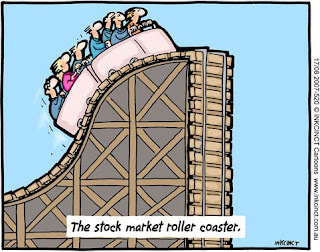 There are a couple of reasons (other than investors taking profit) causing stocks to slide. The New York Federal Reserve's general business conditions index dropped to -9.41 from -4.55 in May. This sent the stocks lower. Commodities and their related stocks fell as the US dollar gained strength. A stronger US dollar was a result of the Russians saying that the dollar is still a good world reserve currency. Crude oil finished at $70.62 per barrel, a drop of -$1.42. Wal-mart (WMT) got downgraded by Goldman Sachs from "buy" to "neutral". It finished at $48.46 or -2.77%. I have always liked WMT though and I still do. There are a few earning reports to watch this week: Target, Fedex and Research in motion. The market was moving in a narrow range today and ended in a slightly positive zone. 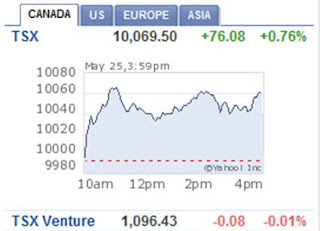 This is the 10th consecutive day in which the market moved within 1%. 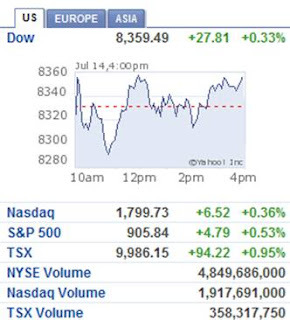 For the week, the Dow gained +0.4% whereas the S&P500 climbed +0.7%. The TSX also finished the week with +0.7%. Gold has had a 3-week rally and investors are seeking profits. Gold prices dropped 2.2% to finish at $940.5. Crude oil pulled back a little to $72.05 a barrel finishing the week with +5.3% gain. The Organization for Petroleum Exporting Countries (OPEC) lowered it's forecast for oil consumption this year in its monthly oil report. It also said that the world oil demand appears to be settling down as the world economy stabilizes. 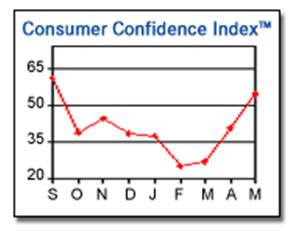 Consumer confidence rose again but it didn't bring the market higher. As oil (i.e. gas) prices rising, people are going to cut back in expenses. They are also concerned about inflation and higher interest rates. The market seems to be in a tug-of-war. It needs big news to push itself higher. Market pulled back a little after the government sold $19 billion in 10-year Treasury notes in a relatively weak auction. Investors are worried that rising interest rates will crimp the economy's recovery. S&P500 was up +3.29 points or +0.35% today. Volume was light again. Oil was up again, at $71.09. Ten banks are allowed to give back the TARP money that they received. They are: JPMorgan Chase (JPM), American Express (AXP), Goldman Sachs Group (GS), U.S. Bancorp (USB), Capital One Financial (COF), Bank of New York Mellon (BK), State Street (STT), BB&T (BBT), Morgan Stanley (MS) and Northern Trust (NTRS). Details about the 19 banks that went through the stress test and received TARP money can be found in this article. The 3 banks that received the most money, Citigroup (C) and Bank of America (BAC) ($45 million each), and Wells Fargo (WFC) ($25 million) are not allowed to give back the money. I don't see it as a good thing. The money was supposed to use for lending and lubricate the economy. Now the banks are giving it back because they don't want to be labelled as the "bad" banks and get intervened by the government. Tomorrow will have interesting data: weekly crude oil inventories which are expected to be lower and weekly mortgage applications. Dow was down -130 points, at some moment today. In the end, it recovered all of the losses and closed at +0.02%. Volume was light. 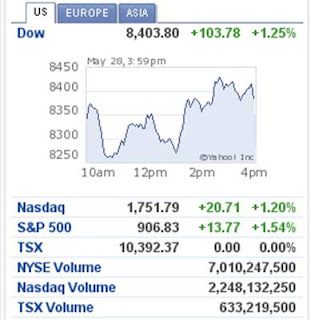 In a light volume trading day, it doesn't take much to move the direction of stocks. The market seemed to be unsure where it wants to go. Investers are wondering whether the rally in recent weeks has become prolonged and whether the seemingly less-bad news have priced into the stock prices already. 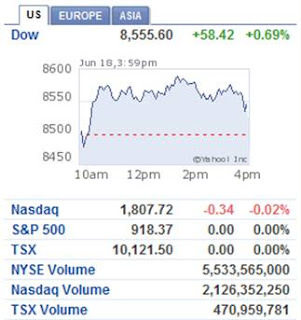 In Canada, TSX was down -20 points. National housing starts is up +9.2%; however, in my home province (British Columbia) it was down -5%. Even though the starts are lower due to existing projects, I do notice movements in the local housing market in Vancouver. I am optimistic. Crude oil fell -$0.35 to $68.09 per barrel. Angiotech Pharmaceuticlas (ANP.TO) jumped +33% to $2.38. The company has received marketing clearance from the U.S. FDA for its Option Inferior Vena Cava Filter to prevent pulmonary embolism. The device can dissolve the blockage of lung artery and preserve blood flow. Sale is expected to reach $300 million in 2012. Angiotech has had a nice run of almost +380% since early May. Intel (INTC) is going to buy Wind River Systems Inc. (WIND) for $884 millions in cash. WIND's software technology is used by NASA, Apple (AAPL), and Hewlett-Packard (HPQ), etc. This deal is expected to close in the summer. This will diversify INTC's business. WIND jumped 47% to $11.76. Retail sales fell in the month of May. Same store sales at Costco (COST) fell 7%, Abercrombie and Fitch (ANF) fell 28%, Nordstrom (JWN)fell 13.1%. Consumers are not willing to spend much yet. Note that two thirds of the US economy is retail. 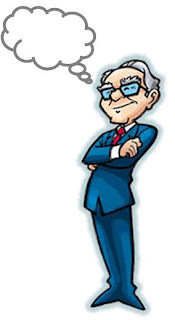 Once you disentangle all these strands -- the cautious Buffett who tends his reputation, Buffett the long-term optimist, Buffett the realist about economics, Buffett the hawk on inflation, and Buffett the domestic investor -- it turns out that Buffett is bullish, but not as bullish as he sounds. His optimism is long-term in nature, and inflation is his hedge. Oil dropped more than $2 t0 $66.12 a barrel. 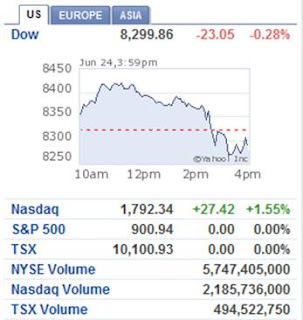 TSX shed -298.67 points becasue of that. Of course, people are due for profit-taking as well. Chevron (CVX) closed at $68.26 and is yielding at 3.7%. I have added USD/CAD chart and Gold chart on the side of this website. I think they are helpful. S&P500 was up +1.87 points. 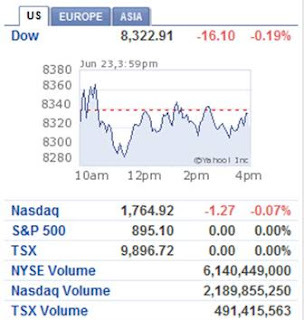 TSX was slightly down -15.27 points. USD/CAD is at 1.0814. Pending home sale in US in April is up 6.7%, largely due to foreclosures. Yet it helped the market to go higher. Think about it. Is it really a piece of positive news? China is the single biggest holder of US debts. Japan is the next biggest one. My adsense is still not approved yet. Man, it takes long. The first day of June, we have a huge gain! I am happy but not happy enough. Humans are greedy. I am greedy. But I have been telling myself not to be greedy a million times today. Oil is at $68.4USD a barrel. USD/CAD is at 1.0921. I am still skeptical though. I think the gain is too much, too soon. People are reacting on news that are less bad. They are jumping in fearing that the are missing out. This is the reverse of massive selloffs we saw last year.